Farrar Straus Giroux, 9780374374457, 32pp. A father and his little girl set out early one morning to go fishing. The girl watches her father closely, noticing how he plucks the worms from the soil with his bare hands, not with a trowel as she does. How he casts his fishing line far out into the lake, while she drops hers over the side of the boat. How patient he is waiting for the fish to bite, while she is restless. His way does not match hers, but that's just fine. In the end she gives Papa an affectionate pat on the back when he catches a fish, just as he patted her back earlier when she caught one. 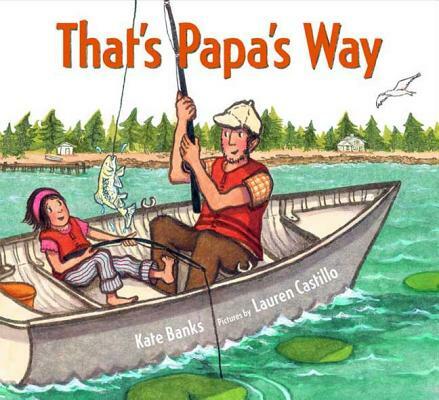 Kate Banks is the author of many books for children, among them Max's Words, And If the Moon Could Talk, winner of the Boston Globe-Horn Book Award, and The Night Worker, winner of the Charlotte Zolotow Award. She grew up in Maine, where she and her two sisters and brother spent a lot of time outdoors, and where Banks developed an early love of reading. "I especially liked picture books," she says, "and the way in which words and illustrations could create a whole new world in which sometimes real and other times magical and unexpected things could happen." Banks attended Wellesley College and received her masters in history at Columbia University. She lived in Rome for eight years but now lives in the South of France with her husband and two sons, Peter Anton and Maximilian.Lauren Castillo's first picture book, What Happens on Wednesdays by Emily Jenkins, was declared "an extremely promising debut" in a starred review from Booklist. She lives in Brooklyn, New York.